Manage your feeding regimen to make it as simple, effective, and efficient as possible. Feeding is one of the most important responsibilities for any horse owner or trainer. Not only must they provide the highest quality feed, but horses can be particular creatures, as anyone involved with them would tell you. This fussiness can complicate things. However, the importance of a balanced feeding regimen is central to nearly all aspects of a horse’s well-being, from their coat to their health and mental state. While there may be a lot of factors to take into account when designing a feeding plan for your horse, the overriding advice to remember in such situations is to keep it simple. That’s not to mean taking a bare-bones approach, but having a streamlined process and defined workflows for feeding your horse to the best dietary, nutritional and physical effect. Switching up a particular feed product, schedule or routine may not be keeping it simple, but it might be required. You’ll want to make sure any changes you make to your horse’s diet are done gradually and that the process goes smoothly. For instance, if a supplement is being added to the regular feed to improve intake of a particular vitamin or mineral, adding the new product in little by little can help the horse better adapt to the change. Any disruption to a horse’s digestion or appetite can cause issues, so avoiding abrupt changes is vital. Any modification that needs to be made is best accomplished incrementally, whether feed amount, time of feeding or feed substances. Any trainer or owner feeding supplements may want to consider consolidating their additives in order to simplify feeding. Consolidating any dietary additives into a one-scoop serving (like from Finish Line’s Total Control) can make feeding easier for the horse. “Total Control was formulated with the specific goal of delivering one maintenance serving of several of Finish Line’s most popular supplements, namely U7, Fluid Action HA, Apple-A-Day, Iron Power and Feet First,” said Nick Cinquino, Finish Line formulation chemist. Sometimes everything about feeding may be planned out to perfection, and still a horse might have difficulty. When problems aren’t due to the feed regimen, they might be caused by poor dentition. Having as simplified a process for feeding as possible also means ensuring your horse is in the best shape possible, and dental issues can get in the way. Misalignment of teeth can lead to sharp edges that make chewing painful, or missing teeth may make chewing ineffective. Keeping an eye on dental health is another step to ensuring the feeding process is optimized and efficient. Want to make feeding time go smoothly? Make sure there’s always enough water. A need for fresh water during feeding is similar to human eating patterns and preferences: Would you sit down to lunch without something to drink? For horses, the stakes are even higher. Lack of water can result in dehydration and can lead to impaction colic, which is feed material getting stuck in the colon. Water is absolutely essential at feeding, but as an old saying warns, horses don’t always drink. Trainers and owners can ensure a simple, safe feeding routine by adding electrolyte supplements to feed or water that may further stimulate thirst. 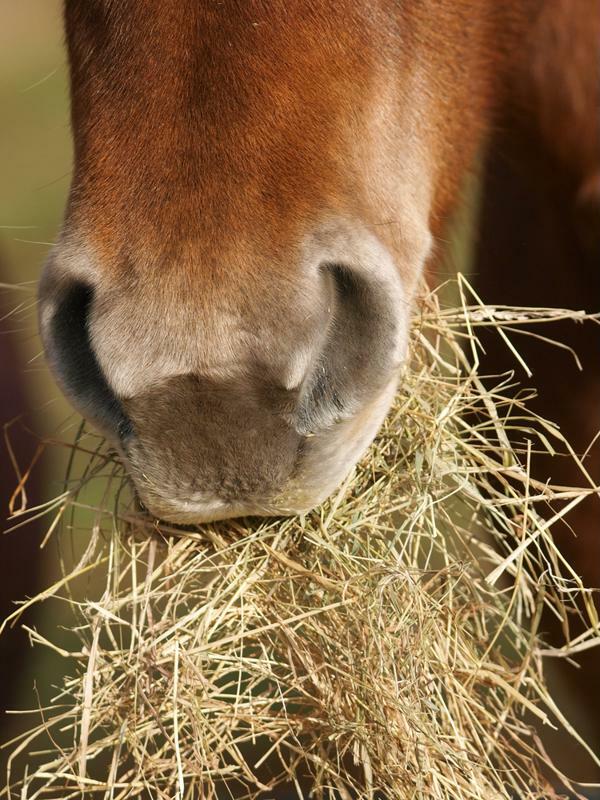 Simplifying your feeding regimen can have all sorts of benefits in caring for horses. Lots of horses travel for competition or shows, and many can get uncomfortable during treks. Trainers and owners need to create as hospitable conditions as they can for horses on the road to ensure positive mood and performance. Feeding is a key component of a road routine that horses can depend on, which regulates their days away. Simplifying the feeding process while in transit begins with planning ahead of time to pack your own supplies and get everything organized. For extended stays this planning becomes even more crucial, as you might want to research your itinerary ahead of time to scout stores you might need to visit if your feed supplies are damaged, lost or depleted. Feeding before or after physical activity isn’t ideal, so avoid it if possible. This is because trying to digest and exercise—or digest and recover from exertion—at the same time is hardly effective and problematic for horses. Simplifying your feeding regimen can have benefits across he spectrum of caring for your horse. Nutrition and dietary intake factor into equine health at almost every level, so ensuring you have an optimized process for feeding is a primary goal for trainers and owners. Talk to the experts at Finish Line today for more information about feed products and what they can do to help.